The common genet and the large-spotted genet are nocturnal and not normally seen on safari. However, we had a couple of experiences with one or both of them. First was at the Serena Mountain Lodge in Mount Kenya National Reserve. Some meat and bones were placed on a platform on a pole near the lodge at night. 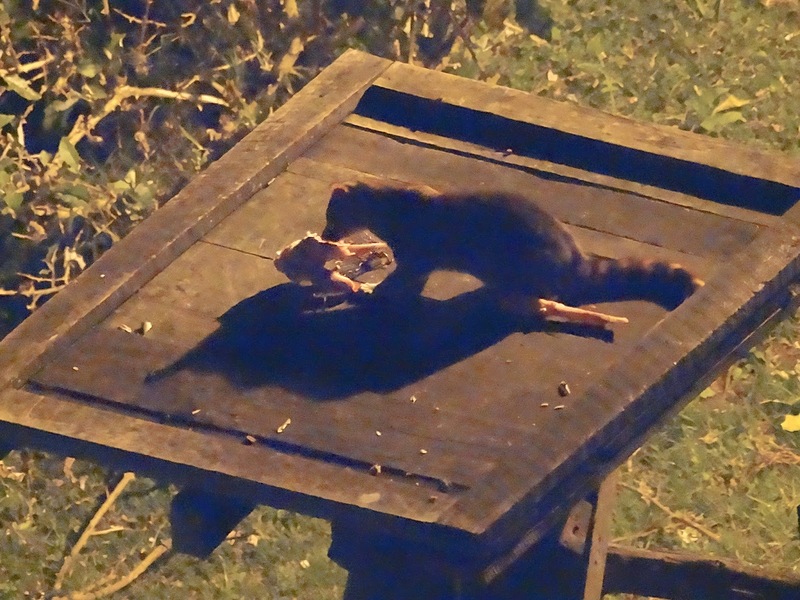 I woke up during the middle of the night to take a view and saw this genet feeding. 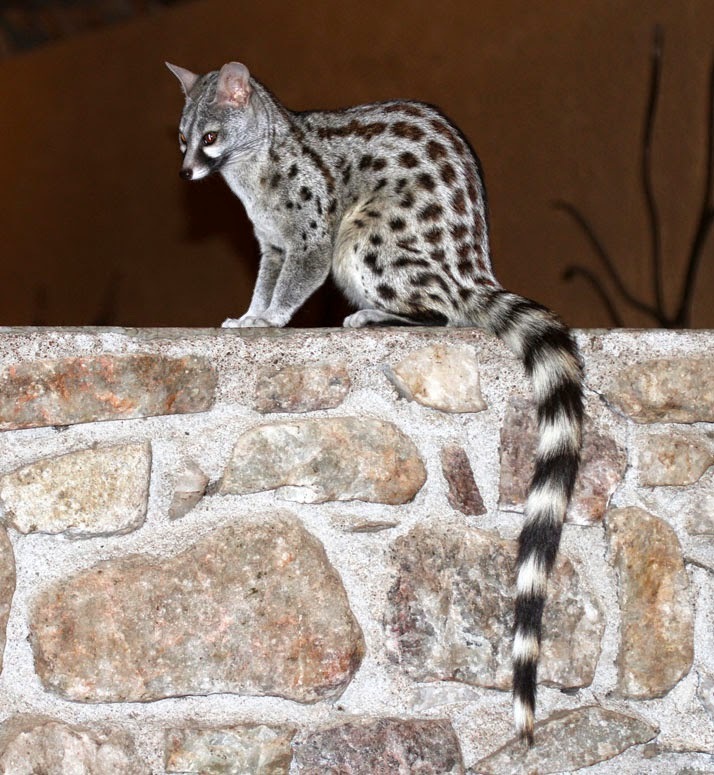 Genet at Serena Mountain Lodge in Mt. Kenya NR. Photo by Mark Edwards. Second was in Buffalo Springs National Reserve. Our driver got a call on his radio that there was a leopard in a tree. We drove quickly to the area and after searching awhile saw a striped tail hanging down the tree which people thought was a leopard. Our driver finally drove off the road to get a closer look and we ultimately determined it was an owl feeding on a genet. Of course, both the owl and genet are nocturnal, so the owl must have captured the genet during the evening. Friends in another vehicle were able to get pictures of the owl when it flew off with the genet. 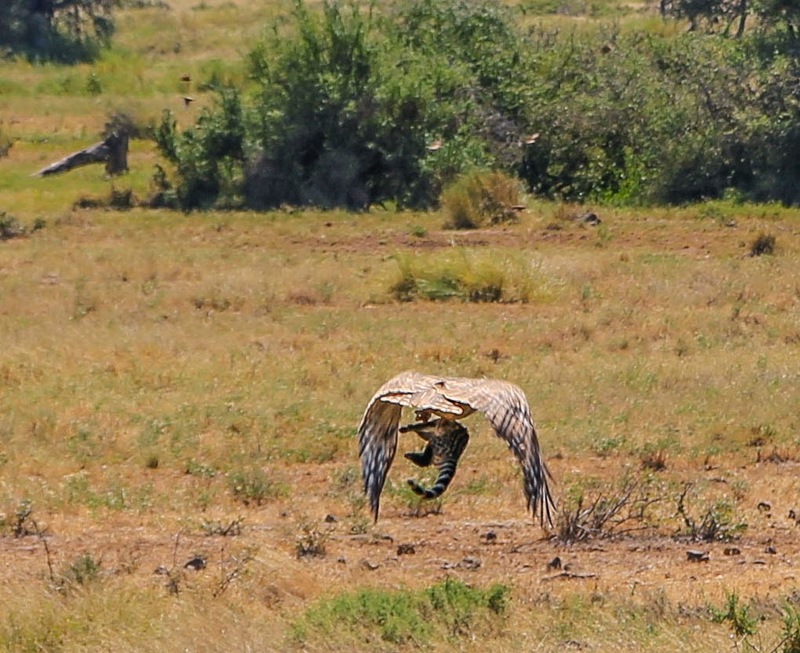 Verreaux's eagle owl with a genet in Buffalo Springs NR. Photo by John Mirau. 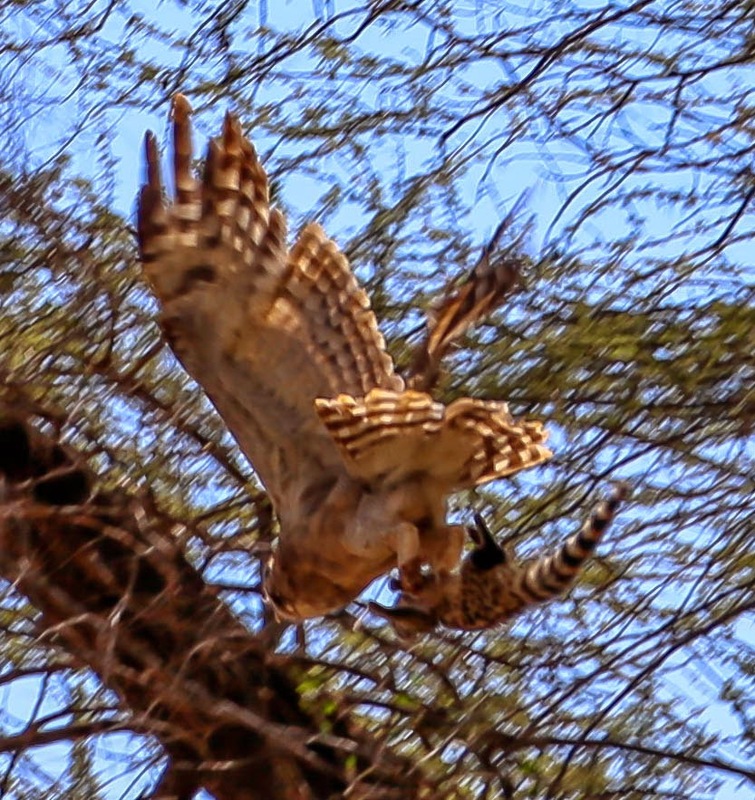 Owl flying out of the tree with the genet in its talons. Photo by Esmee Tooke. Owl flyng with the genet. Photo by Esmee Tooke. 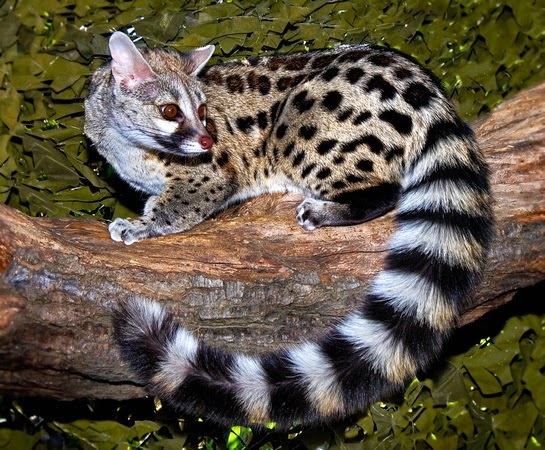 Both the common and large-spotted genet have striped tails. The common usually has a white tip and the large-spotted a black tip, but I've seen a picture of a common genet with a black tip. 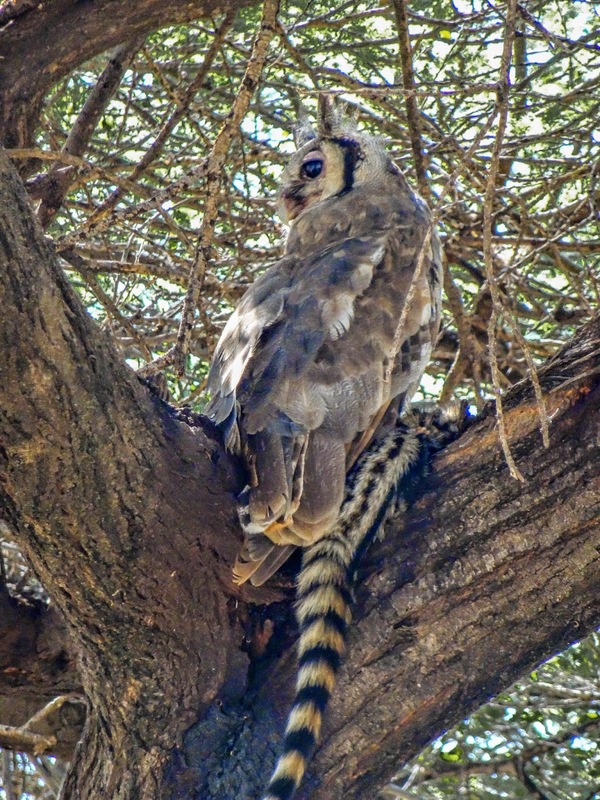 The spots on the genet in the tree with the owl look more like those on the common, but one or both of them may be large-spotted instead. Common genet. Picture from here. Large-spotted genet. Picture from here. Fox + leopard + raccoon. Very interesting animal.